"Supposedly a recipe from George Washington, I have used this recipe for five annual New Year's parties. You MUST make it about 10 days in advance to mellow the flavors. Then it is so smooth one of my guests unknowingly served her 2 year old! Use premium vanilla ice cream to keep it chilled in the punch bowl. I like to shape the ice cream in a star molds, and use them one-at-a-time to chill the eggnog throughout the evening." Pour the brandy, sherry, rum, and whiskey into a bowl. Place the egg yolks and egg whites into two separate, large mixing bowls. Set the egg whites aside. Beat the egg yolks until light and frothy. Gradually beat in the sugar until the egg mixture is light colored. Slowly beat in the liquor mixture. With the mixer still running, pour in the milk and heavy cream until thoroughly blended. Using a clean beater, beat the egg whites until soft peaks form. Gently fold the egg whites into the milk mixture. Pour into two clean, gallon-size plastic milk containers. Refrigerate at least 5 days, or 10 days for an even smoother taste. Shake the container occasionally to keep the alcohol from separating. To serve, pour the eggnog into a punch bowl. 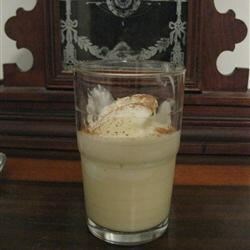 Whisk to blend milk mixture, add the quart of vanilla ice cream, and garnish with nutmeg. We followed the recipe exactly, but what came out of the fridge for our party smelled of rotten egg and was horrendously unpalatable. I'll not be trying this one again. Do not sample while making. My husband had to take the bowl away from me.